This close-up image captured by Europe's Rosetta spacecraft shows a sinkholelike pit on the surface of Comet 67P/Churyumov-Gerasimenko. One year ago today, a spacecraft slipped into orbit around a comet for the first time ever. On Aug. 6, 2014, the European Space Agency's Rosetta probe arrived at Comet 67P/Churyumov–Gerasimenko. The spacecraft immediately began studying the comet and mapping its surface, in part to find a good site for Rosetta's onboard lander, Philae, to touch down. Philae gathered a wealth of data for more than two days before its primary battery ran out. The original plan had called for the lander to then keep operating via its secondary battery, which is recharged by solar power — but Philae's locale didn't offer much sunlight, and the surface craft went into hibernation. Comet 67P is speeding toward its closest approach to the sun, which will happen on Aug. 13, and increasing levels of solar radiation jolted Philae awake in June. But the Rosetta team has had a difficult time establishing stable communications with the lander. The observations made by the Rosetta mothership and Philae are reshaping researchers' ideas about comets, mission interdisciplinary scientist Paul Weissman told Space.com. For example, 67P's rubber-duckie shape surprised scientists. What's more, the comet's rotation rate has sped up by 21 minutes in the past six years, as gases erupted from the object's surface and propelled the small body faster. Scientists are curious to see if this rate will change again when the comet's activity quiets down. "Rosetta will give us a continuous record of nearly three years of how a comet behaves, and how material comes off of it, and if it varies [as the comet] goes around the sun,” said Weissman, who retired from NASA's Jet Propulsion Laboratory in Pasadena, California, on Monday (Aug. 4). He previously worked on NASA's Galileo mission, which studied Jupiter while in orbit from 1995 through 2003; he also worked on some comet mission proposals. Comets are regarded as some of the solar system's basic building blocks, and Rosetta's characterization of 67P has offered a few surprises about the origin of the planets. For example, Rosetta's measurement of the ratio of two different types of hydrogen — "normal" hydrogen and "heavy" hydrogen, also known as deuterium — revealed that 67P's water is very different from that of Earth. "It certainly was a surprise," Weissman said. "The only good measurement we have for another Jupiter-family comet was Hartley 2, and that actually matches Earth water very well." The overall density of Comet 67P is 0.52 grams per cubic centimeter, about half that of water. That number — the first precise measurement of comet density — is also puzzling scientists. 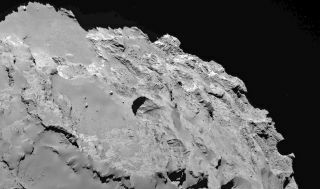 Previous hypotheses suggested that comets are collections of rubble, but 67P's interior appears to be relatively homogeneous, mission scientists have said. The Rosetta orbiter's observations have allowed scientists to map some regions of the comet's surface at a resolution down to just 4.3 inches (11 cm). The probe's pictures revealed strange pits on the comet's nucleus, which appear to be sinkholes, and vast, flat-floored basins dominating the surface rather than the craters that were predicted for a comet of this type. "The compositional data … is mind-blowing," he said. Then there will be more than a year of watching the comet fly outward again, to a distance of about 4 AU — most of the way to Jupiter. The Rosetta mission is slated to end on Sept. 30, 2016. A mission extension is unlikely because the orbiter's solar panels will not collect enough energy at that point to run continuously, Weissman added. But more comet missions may come soon. Weissman has been part of a team proposing a comet sample-return effort under NASA's New Frontiers program, which encompasses missions that cost no more than $1 billion to develop. The New Horizons spacecraft that just flew by Pluto is an example of a New Frontiers mission, as is the Juno Jupiter orbiter, which will arrive in the Jovian system next year. Weissman and his colleagues will try again during the next New Frontiers opportunity, likely next year. If NASA selects the proposed mission, the team's spacecraft launch out to a comet and scoop up a few hundred grams of material for analysis back on Earth. The mission would provide the best measurements yet of what the solar system looked like more than 4.5 billion years ago, when Earth and the other planets were forming, Weissman said.